This statistic illustrates the average monthly costs for buying a residential property in the United Kingdom (UK) from December 2008 to December 2017. 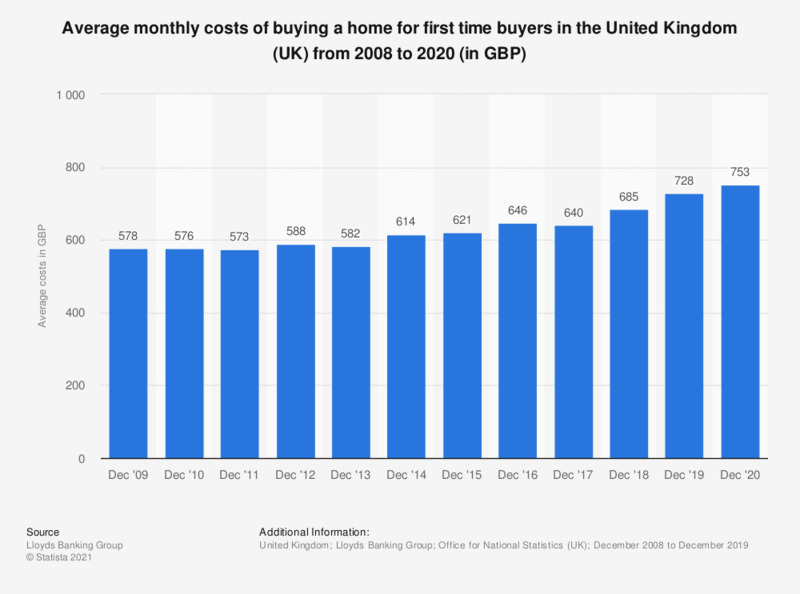 It can be seen that the average monthly cost for buying a home increased between December 2009 and December 2016, reaching a value of 705 British pounds as of December 2016. Although this was the case, the largest monthly cost for purchasing a property during the period under observation was found in December 2008. As of 2017 the average monthly costs for buying a residential property came to 679 British pounds. Buying costs are 12 months to December. Everything On "First time home buyers in the United Kingdom (UK)" in One Document: Edited and Divided into Handy Chapters. Including Detailed References.